listen), colloquially [ɯsˈtambuɫ]) is commonly held to derive from the Medieval Greek phrase "εἰς τὴν Πόλιν" (pronounced [is tim ˈbolin]), which means "to the city" and is how Constantinople was referred to by the local Greeks. This reflected its status as the only major city in the vicinity. The importance of Constantinople in the Ottoman world was also reflected by its Ottoman name 'Der Saadet' meaning the 'gate to Prosperity' in Ottoman. An alternative view is that the name evolved directly from the name Constantinople, with the first and third syllables dropped. A Turkish folk etymology traces the name to Islam bol "plenty of Islam" because the city was called Islambol ("plenty of Islam") or Islambul ("find Islam") as the capital of the Islamic Ottoman Empire. It is first attested shortly after the conquest, and its invention was ascribed by some contemporary writers to Sultan Mehmed II himself. Some Ottoman sources of the 17th century, such as Evliya Çelebi, describe it as the common Turkish name of the time; between the late 17th and late 18th centuries, it was also in official use. The first use of the word "Islambol" on coinage was in 1703 (1115 AH) during the reign of Sultan Ahmed III. A view of Bankalar Caddesi (Banks Street) in the late 1920s. 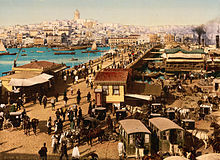 Completed in 1892, the Ottoman Central Bank headquarters is seen at left. In 1995 the Istanbul Stock Exchange moved to İstinye, while numerous Turkish banks have moved to Levent and Maslak. after the departure of the dynasty in 1925, from being the most international city in Europe, Constantinople became one of the most nationalistic....Unlike Vienna, Constantinople turned its back on the past. Even its name was changed. Constantinople was dropped because of its Ottoman and international associations. From 1926 the post office only accepted Istanbul; it appeared more Turkish and was used by most Turks. Global warming in Turkey may cause more urban heatwaves, droughts, storms, and flooding. Sea level rise is forecast to affect city infrastructure, for example Kadıkoy metro station is threatened with flooding.Xeriscaping of green spaces has been suggested, but Istanbul does not have a climate change action plan, merely an inactive website. Built by sultans Abdülmecid and Abdülaziz, the 19th-century Dolmabahçe, Çırağan and Beylerbeyi palaces on the European and Asian shores of the Bosphorus strait were designed by members of the Armenian Balyan family of Ottoman court architects. Completed in 1616, the Sultan Ahmed Mosque is popularly known as the Blue Mosque due to the blue İznik tiles which adorn its interior. Camondo Steps at Bankalar Caddesi (Banks Street) in Galata, constructed by Ottoman-Venetian Jewish banker Abraham Salomon Camondo, c. 1870–1880. The former building of Istanbul Modern, a museum of contemporary art on the Bosphorus, is being replaced by a new one designed by Italian architect Renzo Piano. The new building is a component of the Galataport project for the renovation of the port of Istanbul. Istanbul Atatürk Airport, which handled 63.7 million passengers in 2017, is the city's primary airport. ^ Where governor's office is located. ^ a b c Sources have provided conflicting figures on the area of Istanbul. The most authoritative source on this figure ought to be the Istanbul Metropolitan Municipality (MMI), but the English version of its website suggests a few figures for this area. One page states that "Each MM is sub-divided into District Municipalities ("DM") of which there are 27 in Istanbul" [emphasis added] with a total area of 1,538.9 square kilometers (594.2 sq mi). The Municipal History page appears to be the most explicit and most updated, saying that in 2004, "Istanbul Metropolitan Municipality's jurisdiction was enlarged to cover all the area within the provincial limits". It also states a 2008 law merged the Eminönü district into the Fatih district (a point that is not reflected in the previous source) and increased the number of districts in Istanbul to 39. That total area, as corroborated on the Turkish version of the MMI website, and a Jurisdiction page on the English site is 5,343 square kilometers (2,063 sq mi). ^ The foundation of Byzantion (Byzantium) is sometimes, especially in encyclopedic or other tertiary sources, placed firmly in 667 BCE. Historians have disputed the precise year the city was founded. Commonly cited is the work of 5th-century-BCE historian Herodotus, which says the city was founded seventeen years after Chalcedon, which came into existence around 685 BCE. Eusebius concurs with 685 BCE as the year Chalcedon was founded, but places Byzantion's establishment in 659 BCE. Among more modern historians, Carl Roebuck proposed the 640s BCE and others have suggested even later. The foundation date of Chalcedon is itself subject to some debate; while many sources place it in 685 BC, others put it in 675 BCE or even 639 BCE (with Byzantion's establishment placed in 619 BCE). 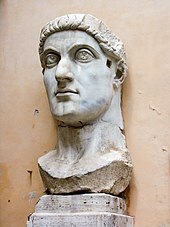 Some sources refer to Byzantium's foundation as the 7th century BCE. ^ a b Historians disagree—sometimes substantially—on population figures of Istanbul (Constantinople), and other world cities, prior to the 20th century. A follow-up to Chandler & Fox 1974,Chandler 1987, pp. 463–505 examines different sources' estimates and chooses the most likely based on historical conditions; it is the source of most population figures between 100 and 1914. The ranges of values between 500 and 1000 are due to Morris 2010, which also does a comprehensive analysis of sources, including Chandler (1987); Morris notes that many of Chandler's estimates during that time seem too large for the city's size, and presents smaller estimates. Chandler disagrees with Turan 2010 on the population of the city in the mid-1920s (with the former suggesting 817,000 in 1925), but Turan, p. 224, is used as the source of population figures between 1924 and 2005. Turan's figures, as well as the 2010 figure, come from the Turkish Statistical Institute. The drastic increase in population between 1980 and 1985 is largely due to an enlargement of the city's limits (see the Administration section). Explanations for population changes in pre-Republic times can be inferred from the History section. ^ The United Nations defines an urban agglomeration as "the population contained within the contours of a contiguous territory inhabited at urban density levels without regard to administrative boundaries". The agglomeration "usually incorporates the population in a city or town plus that in the suburban areas lying outside of, but being adjacent to, the city boundaries". 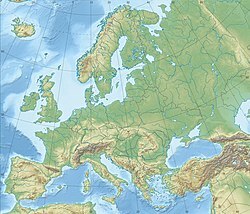 ^ UEFA does not apparently keep a list of Category 4 stadiums, but regulations stipulate that only these elite stadiums are eligible to host UEFA Champions League Finals, which Atatürk Olympic Stadium did in 2005, and UEFA Europa League (formerly UEFA Cup) Finals, which Şükrü Saracoğlu Stadium did in 2009. Türk Telekom Arena is noted as an elite UEFA stadium by its architects. ^ "City mayors:Largest cities in the world by land area, population and density". citymayors.com. Retrieved 26 June 2015. ^ Brown, DR. Evrick (28 May 2014). Walking in the European City. ISBN 978-1-4724-1617-9. ^ a b c "The Results of Address Based Population Registration System, 2018". Turkish Statistical Institute. 1 February 2019. Retrieved 1 February 2019. ^ "Gross Domestic Product by Provinces 2017". Turkstat.gov.tr. ^ "Gross Domestic Product (GDP)". Turkstat.gov.tr. ^ "Sub-national HDI – Area Database – Global Data Lab". hdi.globaldatalab.org. ^ Merriam-Webster's Collegiate Dictionary (11th ed.). Springfield, Mass. 2004. p. 1547. "Istanbul". Merriam-Webster Dictionary. Retrieved 10 April 2019. ^ "Istanbul". The American Heritage Dictionary of the English Language (5th ed.). Boston: Houghton Mifflin Harcourt. 2014. Retrieved 10 April 2019. ^ "Istanbul". Collins English Dictionary. HarperCollins. Retrieved 10 April 2019. ^ Mango, Cyril (1991). "Constantinople". In Kazhdan, Alexander. The Oxford Dictionary of Byzantium. Oxford and New York: Oxford University Press. pp. 508–512. ISBN 0-19-504652-8. ^ Berube, Alan (1 December 2010). "Global Growth on the Orient Express". Brookings Institution blog "The Avenue". Retrieved 14 April 2013. ^ a b c d e f OECD Territorial Reviews: Istanbul, Turkey. Policy Briefs. The Organisation for Economic Co-operation and Development. March 2008. ISBN 978-92-64-04383-1. ^ "Online Etymology Dictionary". Retrieved 26 June 2015. ^ Algan, O.; Yalçın, M.N.K. ; Özdoğan, M.; Yılmaz, Y.C. ; Sarı, E.; Kırcı-Elmas, E.; Yılmaz, İ.; Bulkan, Ö.; Ongan, D.; Gazioğlu, C.; Nazik, A.; Polat, M.A. ; Meriç, E. (2011). "Holocene coastal change in the ancient harbor of Yenikapı–İstanbul and its impact on cultural history". Quaternary Research. 76: 30. Bibcode:2011QuRes..76...30A. doi:10.1016/j.yqres.2011.04.002. ^ "Cultural Details of Istanbul". Republic of Turkey, Minister of Culture and Tourism. Archived from the original on 12 September 2007. Retrieved 2 October 2007. ^ Janin, Raymond (1964). Constantinople byzantine. Paris: Institut Français d'Études Byzantines. pp. 10ff. ^ Müller-Wiener, Wolfgang (1977). Bildlexikon zur Topographie Istanbuls: Byzantion, Konstantinupolis, Istanbul bis zum Beginn d. 17 Jh (in German). Tübingen: Wasmuth. ISBN 978-3-8030-1022-3. ^ Tarasov & Milner-Gulland 2004, p. 121; El-Cheikh 2004, p. 22. ^ "Meclis-i Mebusan (Mebuslar Meclisi)". Tarihi Olaylar. ^ Freedman, Jeri (2009). The Armenian genocide (1st ed.). New York: Rosen Pub. Group. pp. 21–22. ISBN 978-1-4042-1825-3. ^ Globalization, Cosmopolitanism, and the Dönme in Ottoman Salonica and Turkish Istanbul. Marc Baer, University of California, Irvine. ^ a b "6 Ekim İstanbul'un Kurtuluşu". Sözcü. 6 October 2017. ^ "Istanbul from a Bird's Eye View". Governorship of Istanbul. Archived from the original on 17 May 2009. Retrieved 13 June 2010. ^ Parsons, Tom; Toda, Shinji; Stein, Ross S.; Barka, Aykut; Dieterich, James H. (2000). "Heightened Odds of Large Earthquakes Near Istanbul: An Interaction-Based Probability Calculation". Science. Washington, DC. 288 (5466): 661–65. Bibcode:2000Sci...288..661P. doi:10.1126/science.288.5466.661. PMID 10784447. ^ Traynor, Ian (9 December 2006). 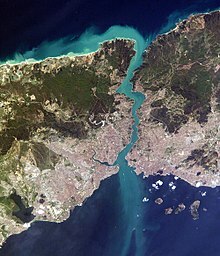 "A Disaster Waiting to Happen – Why a Huge Earthquake Near Istanbul Seems Inevitable". The Guardian. UK. Retrieved 13 June 2010. ^ Kottek, Markus; Grieser, Jürgen; Beck, Christoph; Rudolf, Bruno; Rube, Franz (June 2006). "World Map of the Köppen-Geiger climate classification updated" (PDF). Meteorologische Zeitschrift. 15 (3): 259–63. Bibcode:2006MetZe..15..259K. doi:10.1127/0941-2948/2006/0130. Retrieved 29 March 2013. ^ Peel, M.C. ; Finlayson, B. L.; McMahon, T. A. (2007). "Updated world map of the Köppen-Geiger climate classification" (PDF). Hydrology and Earth System Sciences. 4 (2): 439–73. doi:10.5194/hessd-4-439-2007. Retrieved 29 March 2013. ^ "Total Participation Data: August" (in Turkish). Turkish State Meteorological Service. Archived from the original on 16 May 2012. Retrieved 6 July 2012. ^ "Comparisons of Annual Meanprecipations of Annual Meanprecipitation Gridded and Station Data: An Example from Istanbul, Turkey Yıllık Ortalama Gridlenmiş Yağış Verisi ve İstasyon Yağış Verisinin Karşılaştırılması, İstanbul Örneği – USTAOĞLU – Marmara Coğrafya Dergisi". marmara.edu.tr. Retrieved 12 February 2016. ^ belgrat. "Hüsnuü Yazici Yasdiği Konular". blogspot.com.tr. Retrieved 12 February 2016. ^ "Thick Fog Causes Disruption, Flight Delays in İstanbul". Today's Zaman. 23 November 2009. Archived from the original on 4 November 2013. Retrieved 15 October 2012. ^ "Dense Fog Disrupts Life in Istanbul". Today's Zaman. 6 November 2010. Archived from the original on 4 November 2013. Retrieved 15 October 2012. ^ a b Pelit, Attila. "When to Go to Istanbul". TimeOut Istanbul. Archived from the original on 14 December 2011. Retrieved 19 December 2011. ^ a b c "Resmi İstatistikler (İl ve İlçelerimize Ait İstatistiki Veriler)" [Official Statistics (Statistical Data of Provinces and Districts) – Istanbul] (in Turkish). Turkish State Meteorological Service. Retrieved 10 August 2015. ^ Kindap, Tayfin (19 January 2010). "A Severe Sea-Effect Snow Episode Over the City of Istanbul". Natural Hazards. 54 (3): 703–23. doi:10.1007/s11069-009-9496-7. ISSN 1573-0840. Retrieved 15 October 2012. ^ "Yıllık Toplam Yağış Verileri" [Annual Total Participation Data: Istanbul, Turkey] (in Turkish). Turkish State Meteorological Service. Retrieved 6 July 2012. ^ "İstanbul Bölge Müdürlüğü'ne Bağlı İstasyonlarda Ölçülen Ekstrem Değerler" [Extreme Values Measured in Istanbul Regional Directorate] (PDF) (in Turkish). Turkish State Meteorological Service. Archived from the original (PDF) on 24 May 2011. Retrieved 27 July 2010. ^ Tayanç, Mete; Karaca, Mehmet; Dalfes, H. Nüzhet (1998). "March 1987 Cyclone (Blizzard) over the Eastern Mediterranean and Balkan Region Associated with Blocking". Monthly Weather Review. 126 (11): 3036. Bibcode:1998MWRv..126.3036T. doi:10.1175/1520-0493(1998)126<3036:MCBOTE>2.0.CO;2. Retrieved 27 July 2010. ^ "Resmi İstatistikler (İl ve İlçelerimize Ait İstatistiki Veriler)" [Official Statistics (Statistical Data of Provinces and Districts) – Istanbul] (in Turkish). Turkish State Meteorological Service. Archived from the original on 22 April 2018. Retrieved 22 April 2018. ^ "The Yearly Measurements by Kirecburnu Station Between 1990–1999" (PDF). ^ "The Yearly Measurements by Bahcekoy Station Between 1990–1999" (PDF). ^ "Istanbul, Turkey – Climate data". Weather Atlas. Retrieved 29 March 2017. ^ "Turkey reeling from African heat wave". Daily Sabah. 2 July 2017. ^ "Gov't forced to take measures amid below average rainfall across Turkey". Hürriyet Daily News. 21 January 2018. ^ "Lightning electrifies Istanbul, northwestern Turkey skies as thunderstorms take over". Daily Sabah. 24 July 2018. ^ "Istanbul flood result of Turkey's climate change". Anadolu Agency. 27 July 2017. ^ Şen, Ömer Lütfi. "Climate Change in Turkey". Mercator–IPC Fellowship Program=. Retrieved 27 September 2018. ^ "Temperature to increase significantly in Turkey in 30 years due to global warming, warns climate expert". Hürriyet Daily News. 19 March 2018. ^ Çetin, Nefise; Mansuroğlu, Sibel; Kalaycı Önaç, Ayşe. "Xeriscaping Feasibility as an Urban Adaptation Method for Global Warming: A Case Study from Turkey". Pol. J. Environ. Stud. 27 (3): 1009–18. Retrieved 27 September 2018. ^ "İstanbul Climate Change Action Plan Preparation Project". Archived from the original on 27 September 2018. Retrieved 27 September 2018. ^ Yavuz, Ercan (8 June 2009). "Gov't launches plan to fight illegal construction". Today's Zaman. Archived from the original on 20 January 2012. Retrieved 20 December 2011. ^ Jessica Bourque (4 July 2012). "Poor but Proud Istanbul Neighborhood Faces Gentrification". The New York Times. Retrieved 6 May 2013. ^ "New city construction to begin in six months". Hurriyet Daily News. 22 February 2013. Retrieved 6 May 2013. ^ "Water Supply Systems, Reservoirs, Charity and Free Fountains, Turkish Baths". Republic of Turkey Ministry of Culture and Tourism. Archived from the original on 19 November 2010. Retrieved 29 April 2012. ^ Erder, Sema (November 2009). "Local Governance in Istanbul" (PDF). Istanbul: City of Intersections. Urban Age. London: 46. Retrieved 16 July 2012. ^ a b "Metropolitan Executive Committee". Istanbul Metropolitan Municipality. Archived from the original on 2 January 2012. Retrieved 21 December 2011. ^ "The Mayor". Istanbul Metropolitan Municipality. Retrieved 12 July 2018. ^ "Organizasyon" [Organization] (in Turkish). Istanbul Special Provincial Administration. Archived from the original on 26 November 2011. Retrieved 21 December 2011. ^ "Governor of Istanbul". Governorship of Istanbul. Retrieved 12 July 2018. ^ "2007 statistics". tuik. Archived from the original on 3 November 2012. ^ "1980 Statistics". tuik. Archived from the original on 3 November 2012. ^ "Frequently Asked Questions". World Urbanization Prospects, the 2011 Revision. The United Nations. 5 April 2012. Archived from the original on 7 September 2012. Retrieved 20 September 2012. ^ "File 11a: The 30 Largest Urban Agglomerations Ranked by Population Size at Each Point in Time, 1950–2035" (xls). World Urbanization Prospects, the 2018 Revision. The United Nations. 5 April 2012. Retrieved 21 August 2018. ^ Kamp, Kristina (17 February 2010). "Starting Up in Turkey: Expats Getting Organized". Today's Zaman. Archived from the original on 9 May 2013. Retrieved 27 March 2012. ^ "History of the Ecumenical Patriarch". The Ecumenical Patriarch of Constantinople. Archived from the original on 8 June 2012. Retrieved 20 June 2012. ^ "The Patriarchal Church of Saint George". The Ecumenical Patriarch of Constantinople. Archived from the original on 31 May 2012. Retrieved 20 June 2012. ^ "The Greek Minority and its foundations in Istanbul, Gokceada (Imvros) and Bozcaada (Tenedos)". Hellenic Republic Ministry of Foreign Affairs. 21 March 2011. Archived from the original on 26 July 2012. Retrieved 21 June 2012. ^ Elma Gabela (5 June 2011). "Turkey's Bosniak communities uphold their heritage, traditions". Today's Zaman. Archived from the original on 23 August 2011. Retrieved 20 September 2011. ^ "Going cold Turkey: African migrants in Istanbul see hopes turn sour". IRIN. Retrieved 23 February 2016. ^ "Ruling AKP's demand for list of ballot box clerks raises election fraud concerns – Politics". hurriyetdailynews.com. Retrieved 12 February 2016. ^ "Turkey's AKP Accused of Systemic Election Fraud Plots for Early Presidential and National Elections". nsnbc international. Archived from the original on 4 March 2016. Retrieved 12 February 2016. ^ "Trouble in Turkey's Elections – Erik Meyersson". Erik Meyersson. Retrieved 12 February 2016. ^ "Electoral Fraud Discovered in Sarıyer, Istanbul – Anadolu Türk Haber". anadoluturkhaber.com. ^ "Turkey – Election Fraud, burned non-AKP votes" (video). liveleak.com. ^ "Bloomberg Business". Bloomberg.com. Archived from the original on 6 June 2014. ^ "İstanbul Seçım Sonuçlari". haberler.com. Archived from the original on 5 March 2016. Retrieved 12 February 2016. ^ "Global MetroMonitor". Brookings Institution. 30 November 2012. Archived from the original on 4 June 2013. Retrieved 13 April 2013. ^ a b "Presentation of Reference City: Istanbul". Urban Green Environment. 2001. Archived from the original on 17 January 2012. Retrieved 30 December 2011. ^ Geromel, Ricardo (14 March 2013). "Forbes Top 10 Billionaire Cities – Moscow Beats New York Again". Forbes. Retrieved 27 July 2013. ^ "Dış Ticaretin Lokomotifi İstanbul" [Istanbul is the Locomotive of Foreign Trade] (in Turkish). NTV-MSNBC. 13 February 2006. Archived from the original on 31 May 2013. Retrieved 28 March 2012. ^ Odabaşı, Attila; Aksu, Celal; Akgiray, Vedat (December 2004). "The Statistical Evolution of Prices on the Istanbul Stock Exchange" (Full text). The European Journal of Finance. London. 10 (6): 510–25. CiteSeerX 10.1.1.500.6930. doi:10.1080/1351847032000166931. ^ "History of the Bank". The Ottoman Bank Archives and Research Centre. Archived from the original on 13 April 2012. Retrieved 28 March 2012. ^ "Milestones in ISE History". Istanbul Stock Exchange. 2012. Archived from the original on 25 November 2009. Retrieved 28 March 2012. ^ Mark Bentley; Benjamin Harvey (17 September 2012). "Istanbul Aims to Outshine Dubai With $2.6 Billion Bank Center". Bloomberg Markets Magazine. Retrieved 5 May 2013. ^ "Ports of Turkey". Cerrahogullari T.A.S. Archived from the original on 6 September 2012. Retrieved 28 August 2012. ^ Zeybek, Hülya; Kaynak, Muhtesem (27–30 May 2008). "What Role for Turkish Ports in the Regional Logistics Supply Chains?" (PDF). International Conference on Information Systems and Supply Chain. Archived from the original (PDF) on 6 February 2009. Retrieved 28 August 2012. ^ Kerimoğlu, Ebra; Ciraci, Hale. "Urban Tourism: An Analysis of Visitors to Istanbul" (PDF). Vienna University of Economics and Business. Retrieved 12 February 2016. ^ "İşte yeni İstanbul Modern". Hürriyet. 28 November 2017. ^ Kate Brown (1 March 2018). "Istanbul Modern Closes Ahead of Renzo Piano's Multimillion-Dollar Revamp". Artnet News. ^ "Istanbul Modern". Renzo Piano Building Workshop (RPBW Architects). Retrieved 21 May 2018. ^ "Galataport". Arkitera. Retrieved 21 May 2018. ^ Nikitin, Nikolaj (6 March 2012). "Golden Age for Turkish Cinema". Credit-Suisse. Archived from the original on 17 December 2012. Retrieved 6 July 2012. ^ "History". The Istanbul Foundation for Culture and Arts. Archived from the original on 3 May 2011. Retrieved 13 April 2012. ^ Hensel, Michael; Sungurogl, Defne; Ertaş, Hülya, eds. (January–February 2010). "Turkey at the Threshold". Architectural Design. London. 80 (1). ISBN 978-0-470-74319-5. ^ "Shopping in Singapore is Better than Paris". CNN. 6 January 2012. Archived from the original on 17 April 2012. Retrieved 28 April 2012. ^ "Besiktas: The Black Eagles of the Bosporus". FIFA. Retrieved 8 April 2012. ^ "Turkey – List of Champions". www.rsssf.com. RSSSF. Retrieved 31 May 2018. ^ "Puan Durumu: 2015–2016 Sezonu 30. Hafta" [League Table: 2015–16 Season, Round 30] (in Turkish). Turkish Basketball Super League. Retrieved 6 June 2016. ^ "List of Certified Athletics Facilities". The International Association of Athletics Federations. 1 January 2013. Retrieved 2 January 2013. ^ "Istanbul to host 2020 Champions League final, Uefa confirms". The Independent. 24 May 2018. Retrieved 24 May 2018. ^ "2008/09: Pitmen strike gold in Istanbul". The Union of European Football Associations. 20 May 2009. Archived from the original on 17 September 2013. Retrieved 10 April 2012. ^ "Türk Telekom Arena Istanbul". 'asp' Architekten. Archived from the original on 26 April 2013. Retrieved 5 July 2012. ^ "2010 FIBA World Championship Istanbul: Arenas". FIBA. Archived from the original on 3 June 2013. Retrieved 10 April 2012. ^ "Istanbul – Arenas". FIBA. 2010. Archived from the original on 3 June 2013. Retrieved 29 June 2012. ^ "Events" (PDF). FIA World Touring Car Championship. 2012. Archived from the original on 16 June 2012. Retrieved 29 June 2012. ^ "The Circuits". European Le Mans Series. 2012. Archived from the original on 7 July 2012. Retrieved 3 July 2012. ^ "2000 Race Calendar". F1 Powerboat World Championship. 2000. Retrieved 8 January 2017. ^ "Powerboat P1 – 2009 World Championship – Istanbul, Turkey". Supersport. 21 June 2009. ^ "2012 Yarış Programı ve Genel Yarış Talimatı" [2012 Race Schedule and General Sailing Instructions] (in Turkish). The Istanbul Sailing Club. 2012. Archived from the original on 4 June 2012. Retrieved 3 July 2012. ^ "Tiraj". Medyatava (in Turkish). 25 December 2016. Retrieved 25 December 2016. ^ a b "TRT – Radio". The Turkish Radio and Television Corporation. Archived from the original on 9 June 2011. Retrieved 8 May 2012. ^ "TRT – Television". The Turkish Radio and Television Corporation. Archived from the original on 14 August 2011. Retrieved 8 May 2012. ^ "History". Istanbul University. 11 August 2011. Archived from the original on 13 November 2012. Retrieved 20 August 2012. ^ "History". Istanbul Technical University. Archived from the original on 18 June 2012. Retrieved 4 July 2012. ^ "University Profile: Istanbul Technical University, Turkey". Board of European Students of Technology. Archived from the original on 16 November 2011. Retrieved 30 March 2012. ^ "State Universities". The Turkish Council of Higher Education. Archived from the original on 30 November 2011. Retrieved 30 March 2012. ^ "About Marmara". Marmara University. Archived from the original on 30 June 2012. Retrieved 4 July 2012. ^ "Private Universities". The Turkish Council of Higher Education. Archived from the original on 30 November 2011. Retrieved 30 March 2012. 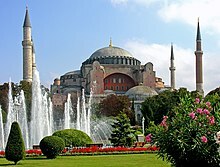 ^ "Aecom expands role on $2.2bn Istanbul scheme". everythingturkish.com.au. EverythingTurkish. 5 September 2012. Archived from the original on 21 September 2016. Retrieved 31 August 2016. ^ "Historique" [History] (in French). Galatasaray University. Archived from the original on 21 March 2012. Retrieved 30 March 2012. ^ "Millî Eğitim Bakanlığı Anadolu Liseleri Yönetmeliği" [Ministry of Education Regulation on Anatolian High Schools] (in Turkish). Ministry of Education. 5 November 1999. Archived from the original on 15 June 2012. Retrieved 30 March 2012. ^ "The History of the Italian School". Liceo Italiano. Archived from the original on 20 January 2012. Retrieved 3 July 2012. ^ "Principles of Education". Darüşşafaka High School. Archived from the original on 9 May 2012. Retrieved 6 July 2012. ^ "Kabataş Erkek Lisesi" (in Turkish). Kabataş Erkek Lisesi. Archived from the original on 2 April 2012. Retrieved 31 March 2012. ^ "KAL Uygulamalı Yabancı Dil Laboratuvarı" [KAL Applied Foreign Language Lab] (in Turkish). Kadıköy Anadolu Lisesi. Archived from the original on 20 June 2013. Retrieved 31 March 2012. ^ a b c "Silahtarağa Power Plant". SantralIstanbul. Archived from the original on 30 July 2012. Retrieved 31 March 2012. ^ a b c d "About Us | Brief History". The Post and Telegraph Organization. Archived from the original on 4 August 2011. Retrieved 31 March 2012. ^ "3rd Bosphorus bridge opening ceremony". TRT World. 25 August 2016. Archived from the original on 28 August 2016. ^ ERM Group (Germany and UK) and ELC-Group (Istanbul) (January 2011). "Volume I: Non Technical Summary (NTS)" (PDF). Eurasia Tunnel Environmental and Social Impact Assessment. The European Investment Bank. Retrieved 4 July 2012. ^ Letsch, Constanze (8 June 2012). "Plan for New Bosphorus Bridge Sparks Row Over Future of Istanbul". The Guardian. Retrieved 4 July 2012. ^ "Istanbul's $1.3BN Eurasia Tunnel prepares to open". Anadolu Agency. 19 December 2016. ^ a b c "Chronological History of IETT" (PDF). Istanbul Electricity, Tramway and Tunnel General Management. Archived from the original on 16 June 2012. Retrieved 1 April 2012. ^ "T1 Bağcılar–Kabataş Tramvay Hattı" [T1 Bağcılar–Kabataş Tram Line] (in Turkish). İstanbul Ulaşım A.Ş. (Istanbul Transport Corporation). Archived from the original on 18 April 2014. Retrieved 20 August 2012. ^ "F1 Taksim–Kabataş Füniküler Hattı" [F1 Bağcılar–Kabataş Funicular Line] (in Turkish). İstanbul Ulaşım A.Ş. (Istanbul Transport Corporation). Archived from the original on 26 August 2012. Retrieved 20 August 2012. ^ "Raylı Sistemler" [Rail Systems] (in Turkish). İstanbul Ulaşım A.Ş. (Istanbul Transport Corporation). Archived from the original on 9 April 2014. Retrieved 20 August 2012. ^ "Ağ Haritaları" [Network Maps] (in Turkish). İstanbul Ulaşım A.Ş. (Istanbul Transport Corporation). Archived from the original on 15 August 2012. Retrieved 20 August 2012. ^ "Public Transportation in Istanbul". Istanbul Electricity, Tramway and Tunnel General Management. Archived from the original on 4 January 2013. Retrieved 3 April 2012. ^ "Metrobus". Istanbul Electricity, Tramway and Tunnel General Management. Archived from the original on 6 October 2011. Retrieved 3 April 2012. ^ "Interaktif Haritalar | İç Hatlar" [Interactive Map of Timetables | Inner-City Lines] (in Turkish). İDO. Archived from the original on 31 May 2012. Retrieved 3 April 2012. ^ "Dış Hatlar" [Interactive Map of Timetables | Inter-City Lines] (PDF) (in Turkish). İDO. Archived from the original on 16 June 2012. Retrieved 3 April 2012. ^ Grytsenko, Sergiy (26 September 2011). "EBRD Supports Privatisation of Ferry Operations in Istanbul". The European Bank for Reconstruction and Development. Archived from the original on 17 June 2013. Retrieved 4 April 2012. ^ "Liman Hizmetleri" [Port Services] (in Turkish). Turkey Maritime Organization. 10 February 2011. Archived from the original on 16 October 2012. Retrieved 28 August 2012. ^ "Bölgesel Yolcu Trenleri" [Regional Passenger Trains] (in Turkish). Turkish State Railways. Archived from the original on 4 April 2012. Retrieved 3 April 2012. ^ "Transports to Middle-Eastern Countries". Turkish National Railways. Archived from the original on 15 April 2012. Retrieved 3 April 2012. ^ a b Akay, Latifa (5 February 2012). "2012 Sees End of Line for Haydarpaşa Station". Today's Zaman. Archived from the original on 16 September 2013. Retrieved 3 April 2012. ^ "İstanbul Otogarı" [Istanbul Bus Station] (in Turkish). Avrasya Terminal İşletmeleri A.Ş. (Eurasian Terminal Management, Inc.). Archived from the original on 20 April 2012. Retrieved 3 April 2012. ^ "2015 Airport Traffic Statistics". Airport Council International. 11 April 2016. Retrieved 7 June 2016. ^ a b "Preliminary 2013 World Airport Traffic and Rankings". Airports Council International. 17 March 2014. Retrieved 25 March 2014. ^ "Yolcu Trafiği (Gelen-Giden)" [Passenger Traffic (Incoming-Outgoing)] (in Turkish). General Directorate of State Airports Authority. Archived from the original (PDF) on 4 November 2013. Retrieved 30 March 2013. ^ "Sabiha Gökçen Named World's Fastest Growing Airport". Today's Zaman. 18 August 2011. Archived from the original on 16 September 2013. Retrieved 4 April 2012. ^ a b "'Third airport a must to ease air traffic in İstanbul'". Today's Zaman. 29 April 2012. Archived from the original on 4 November 2013. Retrieved 6 May 2013. ^ "Consortium wins Istanbul airport tender for 22.1 billion euros". Hurriyet Daily News. 3 May 2013. Retrieved 6 May 2013. ^ "It will be the biggest airport of the world". 24 January 2013. Archived from the original on 29 January 2013. Retrieved 24 January 2013. ^ Damien Sharkov (14 August 2014). "Istanbul's New Erdoğan-Backed Airport to Be Named After... Erdoğan". Newsweek. Retrieved 8 March 2016. ^ "Erdogan Airport: Istanbul's Super Hub 'to be Named After Turkey's President-Elect'". International Business Times UK. Retrieved 12 February 2016. Athanasopulos, Haralambos (2001). Greece, Turkey, and the Aegean Sea: A Case Study in International Law. Jefferson, NC: McFarland & Company, Inc. ISBN 978-0-7864-0943-3. Barnes, Timothy David (1981). Constantine and Eusebius. Cambridge, MA: Harvard University Press. ISBN 978-0-674-16531-1. Baynes, Norman H. (1949). Baynes, Norman H.; Moss, Henry S.L.B, eds. Byzantium: An Introduction to East Roman Civilization. Oxford: Clarendon Press. ISBN 978-0-674-16531-1. Boyar, Ebru; Fleet, Kate (2010). A Social History of Ottoman Istanbul. Cambridge: Cambridge University Press. ISBN 978-0-521-13623-5. Brink-Danan, Marcy (2011). Jewish Life in Twenty-First-Century Turkey: The Other Side of Tolerance. New Anthropologies of Europe. Bloomington, IN: Indiana University Press. ISBN 978-0-253-35690-1. Brummett, Palmira Johnson (2000). Image and Imperialism in the Ottoman Revolutionary Press, 1908–1911. Albany, NY: SUNY Press. ISBN 978-0-7914-4463-4. Çelik, Zeynep (1993). The Remaking of Istanbul: Portrait of an Ottoman City in the Nineteenth Century. Berkeley and Los Angeles: University of California Press. ISBN 978-0-520-08239-7. Chandler, Tertius (1987). Four Thousand Years of Urban Growth: An Historical Census. Lewiston, NY: St. David's University Press. ISBN 978-0-88946-207-6. De Sélincourt, Aubery (2003). Marincola, John M., ed. The Histories. Penguin Classics. London: Penguin Books. ISBN 978-0-14-044908-2. De Souza, Philip (2003). The Greek and Persian Wars, 499–386 B.C. London: Routledge. ISBN 978-0-415-96854-6. Dumper, Michael; Stanley, Bruce E., eds. (2007). Cities of the Middle East and North Africa: A Historical Encyclopedia. Santa Barbara, CA: ABC-CLIO. ISBN 978-1-57607-919-5. Georgacas, Demetrius John (1947). "The Names of Constantinople". Transactions and Proceedings of the American Philological Association. 78: 347–67. doi:10.2307/283503. JSTOR 283503. Gregory, Timothy E. (2010). A History of Byzantium. Oxford: John Wiley and Sons. ISBN 978-1-4051-8471-7. Gül, Murat (2012). The Emergence of Modern Istanbul: Transformation and Modernisation of a City (Revised Paperback ed.). London: IB.Tauris. ISBN 978-1-78076-374-3. Harter, Jim (2005). World Railways of the Nineteenth Century: A Pictorial History in Victorian Engravings (illustrated ed.). Baltimore, MD: Johns Hopkins University Press. ISBN 978-0-8018-8089-6. Holt, Peter M.; Lambton, Ann K.S. ; Lewis, Bernard, eds. (1977). The Cambridge History of Islam. 1A (illustrated, reprint ed.). Cambridge: Cambridge University Press. ISBN 978-0-521-29135-4. Keyder, Çağlar, ed. (1999). Istanbul: Between the Global and the Local. Lanham, MD: Rowman & Littlefield. ISBN 978-0-8476-9495-2. King, Charles (2014). Midnight at the Pera Palace, The birth of modern Istanbul. Norton & Cy. ISBN 97-80393089141. Köse, Yavuz (2009). "Vertical Bazaars of Modernity: Western Department Stores and Their Staff in Istanbul (1889–1921)". In Atabaki, Touraj; Brockett, Gavin. Ottoman and Republican Turkish Labour History. Cambridge: Cambridge University Press. pp. 91–114. ISBN 978-0-521-12805-6. Morris, Ian (October 2010). Social Development (PDF). Stanford, Calif.: Stanford University. Archived from the original (PDF) on 15 September 2012. Retrieved 5 July 2012. Necipoğlu, Gülru (1991). Architecture, Ceremonial, and Power: The Topkapi Palace in the Fifteenth and Sixteenth Centuries. Cambridge, MA: The MIT Press. ISBN 978-0-262-14050-8. Norris, Pippa (2010). Public Sentinel: News Media & Governance Reform. Washington, DC: World Bank Publications. ISBN 978-0-8213-8200-4. Oxford Business Group (2009). The Report: Turkey 2009. Oxford: Oxford Business Group. ISBN 978-1-902339-13-9. Quantic, Roy (2008). Climatology for Airline Pilots. Oxford: John Wiley & Sons. ISBN 978-0-470-69847-1. Reinert, Stephen W. (2002). "Fragmentation (1204–1453)". In Mango, Cyril. The Oxford History of Byzantium. Oxford: Oxford University Press. ISBN 978-0-19-814098-6. Reisman, Arnold (2006). Turkey's Modernization: Refugees from Nazism and Atatürk's Vision. Washington, DC: New Academia Publishing, LLC. ISBN 978-0-9777908-8-3. Room, Adrian (2006). Placenames of the World: Origins and Meanings of the Names for 6,600 Countries, Cities, Territories, Natural Features, and Historic Sites (2nd ed.). Jefferson, NC: McFarland & Company. ISBN 978-0-7864-2248-7. Sanal, Aslihan (2011). Fischer, Michael M.J.; Dumit, Joseph, eds. New Organs Within Us: Transplants and the Moral Economy. Experimental Futures (illustrated ed.). Chapel Hill, NC: Duke University Press. ISBN 978-0-8223-4912-9. Schmitt, Oliver Jens (2005). Levantiner: Lebenswelten und Identitäten einer ethnokonfessionellen Gruppe im osmanischen Reich im "langen 19. Jahrhundert" (in German). Munich: Oldenbourg. ISBN 978-3-486-57713-6. Shaw, Stanford J.; Shaw, Ezel K. (1977). History of the Ottoman Empire and Modern Turkey. 2. Cambridge: Cambridge University Press. ISBN 978-0-521-29166-8. Wynn, Martin (1984). Planning and Urban Growth in Southern Europe. Studies in History, Planning, and the Environment. Los Altos, CA: Mansell. ISBN 978-0-7201-1608-3.